If you've seen any of the "Toy Story" movies, you probably remember a space fantasy-themed toy called Buzz Lightyear. Although not the main character in the films, he has proven to be immensely popular and now has his very own attraction at Tokyo Disneyland. The premise of Buzz Lightyear's Astro Blasters is that a bad guy named Zerg has stolen the batteries from the toys, and it's your job to venture into outer space and help Buzz defeat Zerg and his minions. Facilitating this, Buzz Lightyear's Astro Blasters is a hybrid attraction of sorts. At its core it is a fairly typical dark ride, similar to other dark rides like Snow White's Adventures or Pinocchio's Daring Journey. 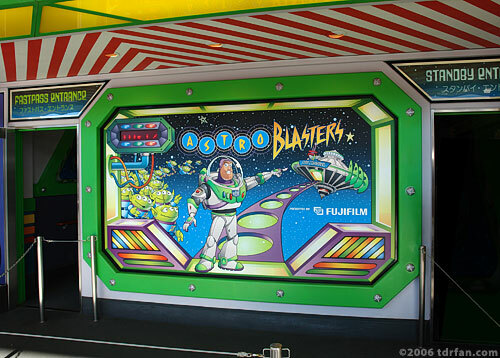 However, Buzz Lightyears's Astro Blasters adds an interactive element in the form of an electronic shooting gallery. Each ride vehicle is equipped with two ray gun-looking devices which you use to point and shoot at a myriad number of targets that appear throughout the ride. The targets vary in shape and size, and the smaller the target the higher the points you receive. Your score appears on a digital counter at the front of the vehicle, and at the end of the ride you can check your score on a chart to see what level you achieved. There is no prize for a high score, other than bragging rights. Like most dark rides, the ride vehicles move fairly slowly. An interesting twist to these ride vehicles though, is the ability to rotate them and point them in any direction using a joystick mounted on the front console of the vehicle. When you spot that high scoring target that you just must hit, you can point the front of the vehicle right at it giving you a better shot. I am usually a deft marksman, but I have to admit it took me several times through the ride to get the hang of aiming the gun. The guns have no sights, so it's a matter of lining up the top of the gun at just about the bottom of a particular target to get a successful "hit." Here is a tip which should help increase your score: You can hit the same target multiple times, so when you've lined up a successful shot keep pulling the trigger. Even if you didn't shoot at anything, Buzz Lightyear's Astro Blasters is a visually appealing ride. The sets and characters all have a colorful, florescent look to them, and there's lots of animated action going on around you. This is a popular attraction, but because the ride vehicles are on a non-stop loop the lines move fairly quickly. This ride is a lot of fun, especially if you have someone riding with you to challenge for the highest score.